Flagger Positions – Where Do You Stand? Home Blog Flagger Positions – Where Do You Stand? In the April 2016 issue of On the Move, we examined the quality and safety of personal protection equipment (PPE), as well as traffic control devices such as traffic cones. The common measure of these work zone elements is maintaining high visibility. When visibility diminishes, the effective safety component is removed. It is easy to see, or not see, the effectiveness of proper PPE. 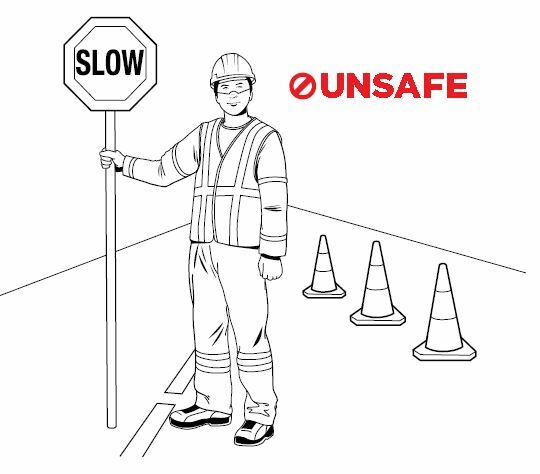 Having crews stand in the appropriate location while actively flagging or monitoring a work zone is the true hallmark of a safe, quality flagging operation. Identifying the optimal physical location for the crew requires a tacit knowledge of best practices with a keen awareness of roadway conditions. Here are three crew positioning mistakes often seen in poor-quality work zone setups. Flaggers should stand in front of the first cone in a taper, per the published standards in that region. Flagging stations should always be highly visible and avoid visual obstructions such as trees, excessive shade, etc. When setting up on a curved roadway, the cone taper should be extended to present the best visible line of site for the flagging station. 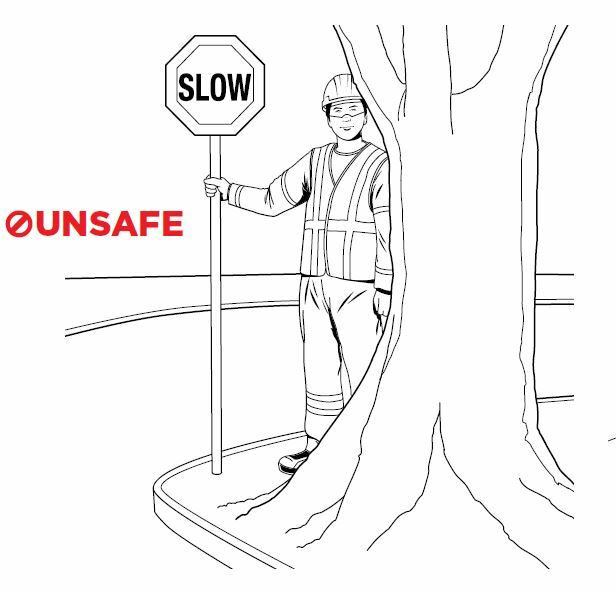 The illustration above demonstrates a flagger in a location with poor visibility. Flaggers should always have a clear escape route behind them in the event of an errant vehicle entering the work zone. Positioning a flagging station’s escape route in front of an obstruction, such as a traffic control device (e.g., cones) or guardrail, puts the crew in grave danger of injury. A quality setup should always have obvious and clear escape routes. The illustration above demonstrates an unsafe escape route. An unsafe practice is to position a flagging station in the travel lane with the intention of increasing a flagger’s visibility. A flagging station should never be located in the middle of the travel lane, as it increases the likelihood of a vehicle strike. A quality setup will always have a flagger controlling traffic from the shoulder or edge of the road, close to the established escape routes. The illustration above demonstrates a flagger in an incorrect position. Flagger Force Traffic Control Services® is recognized as an industry leader in temporary traffic control. 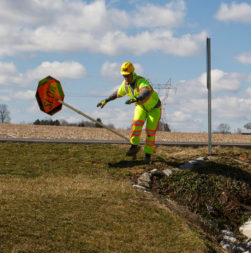 In 2002, the company was founded by entrepreneurs Michele and Mike Doner, who began with just a handful of employees, one pickup truck, and the signs, stands, and cones needed to control traffic in a work zone. Today, Flagger Force establishes safe work zones throughout the entire Mid-Atlantic region, with approximately 900 trucks on the road and career opportunities for more than 1,600 full-time employees. Our clients have embraced our quality and safety standards, which has allowed us to continuously expand our geographic reach. Flagger Force now has 11 operating locations, including our corporate headquarters in Hummelstown, Pennsylvania. Flagger Positions - Where Do You Stand? Identifying the optimal physical location for the crew requires a tacit knowledge of best practices with a keen awareness of roadway conditions. Here are three crew positioning mistakes often seen in poor-quality work zone setups.